Gandhi Jayanti is a national holiday celebrated in India to mark the occasion of the birthday of Mohandas Karamchand Gandhi. United Nations General Assembly announced on 15 June 2007 that it adopted a resolution which declared that 2 October will be celebrated as the International Day of Non-Violence. Now time for some trivia that you might not know. MV Hannington Court was a cargo ship of the Court Line. Launched in 1954 as part of the company’s rebuilding programme after the Second World War, she sailed for a number of years before being sold to an Indian company in 1963 and renamed Gandhi Jayanti. She was again sold in 1967, was renamed Gandhi in 1974, and was scrapped in 1976. On 15 June 2007 the United Nations General Assembly voted to establish 2 October as the International Day of Non-Violence. And with that piece of trivia out of the way, let me come to the reason that got you here. Given below are some of the special combos that we are running today. CAT 2016 Course (with test series) + GK + DM + XAT Test Series – 6750 Rs. CAT 2016 Online Course (with test series) – 5400 Rs. CAT 2016 Online Course – 4500 Rs. IBPS PO 2016 Course (with test series) – 2250 Rs. GK + Decision Making + XAT Test Series – 1620 Rs. Use coupon code GANDHI to get 10% off on all courses! This coupon code is valid on all courses on the Handa Ka Funda website. This is also valid on all test series and combo offers. You can directly jump to the required pages from the buttons given below. 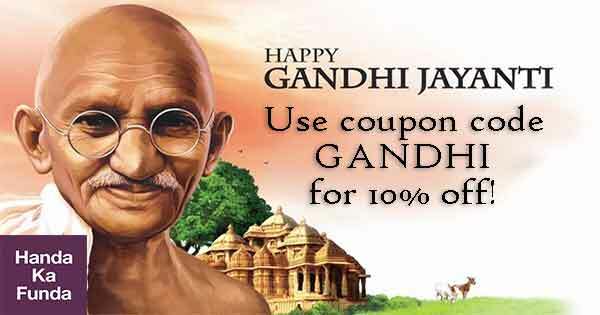 You can use coupon code GANDHI on those courses.